This article holds a patronymic name. This person is addressed by his name, Hailemariam, and not as Desalegn. Hailemariam Desalegn Boshe (Amharic: ኃይለማሪያም ደሳለኝ ቦሼ? ; born 19 July 1965) is an Ethiopian politician who has served as Prime Minister of Ethiopia since 2012. Hailemariam Desalegn previously served as Deputy Prime Minister and Minister of Foreign Affairs under Prime Minister Meles Zenawi from 2010 to 2012. When Meles died in August 2012, Hailemariam Desalegn succeeded him as Prime Minister, initially in an acting capacity. He was then elected as the Chair of the Ethiopian People's Revolutionary Democratic Front (EPRDF), the ruling party, on 15 September 2012. Hailemariam Desalegn also served as the Chairperson of the African Union from 2013 to 2014. Hailemariam was born in 1965 in the Boloso Sore District of the Wolayita Zone in southern Ethiopia. He studied and spent most of his youth in the area. Hailemariam is from the Wolayta ethnic group of Ethiopia, an Omotic community which forms the principal population group in Ethiopia's Southern Nations, Nationalities, and People's Region. His family belongs to the Apostolic Church of Ethiopia, a Oneness Pentecostal denomination that is not part of mainstream Ethiopian Protestant Christianity (Pentay), which believes in Trinitarianism. His name 'Hailemariam' is in Geez, the liturgical language of Ethiopia's Orthodox Church, and means "the power of St Mary". His official name of address is Hailemariam (long form: Hailemariam Desalegn), the second name being Amharic for "I am pleased", and the given name of his father, Desalegn Boshe. In 1988, Hailemariam received a bachelor's degree in civil engineering from Addis Ababa University. He subsequently worked as a graduate assistant in the Arba Minch Water Technology Institute (now Arba Minch University). After two years of working in this capacity, he won a scholarship to Tampere University of Technology in Finland, where he earned a master's degree in sanitation engineering. Upon his return to Ethiopia, he served in different academic and administrative capacities, including the dean of the Water Technology Institute, for 13 years. In between, he also earned an MA in Organizational Leadership at Azusa Pacific University, California, US. In the late 1990s and early 2000s, he became seriously involved in politics as member of the EPRDF (Ethiopia's ruling party) and became the deputy president of the SNNPR. He replaced Abate Kisho who was removed from power on corruption charges, but it is believed that Abate was demoted for supporting the anti-Meles Zenawi faction when the Tigrayan People's Liberation Front (the core of the EPRDF) split in 2000. Another widely accepted belief about Abate was that he was less educated and exercised poor leadership while he was in power. Hailemariam was President of the Southern Nations, Nationalities, and People's Region (SNNPR) from November 2001 to March 2006 and was promoted to Deputy Prime Minister and Minister of Foreign Affairs in October 2010. He has been Deputy Chairman of EPRDF, Chairman of SEPDM, Deputy Prime Minister and Minister of Foreign Affairs. He has served as: Vice President of the SNNPR (2000–2002); President of the SNNPR (2002–2005); Member of the House of People’s Representatives (2005–present); Social Affairs Special Advisor to the PM, then Public Mobilization & Participation Special Advisor to the Prime Minister (2005–2008); Government Chief Whip, with a Ministerial portfolio (2008–2010). Party Posts: Member of the Executive Committee of the EPRDF and the SEPDM (2000–present); Chairman of the SEPDM (2002–present); Deputy Chairman of the EPRDF (since Sept 2010). After his tenure as President of the SNNPR, Hailemariam worked in the Prime Minister's Office as the advisor on Social Affairs and Civic Organizations and Partnerships for two years. He led the team that drafted the Charities and Societies Proclamation law (CSO law) that limits the interference of international non-governmental organizations (NGOs) in local political activities. 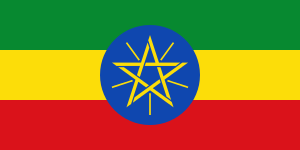 The law was adopted by the Ethiopian Parliament in 2009. He is also credited in pushing EPRDF to re-organize its structure after the contentious 2005 elections via the '1-to-5' model (one member recruits five new people - አንድ ለአምስት አደረጃጀት) that boosted the number of party members from 400,000 to five million by the 2010 elections. In 2010, Hailemariam was sworn into dual ministerial positions as Deputy Prime Minister and Minister of Foreign Affairs. Following the death of Ethiopia's long-time Prime Minister Meles Zenawi on 20 August 2012, Deputy Prime Minister Hailemariam was appointed as the acting Premier. 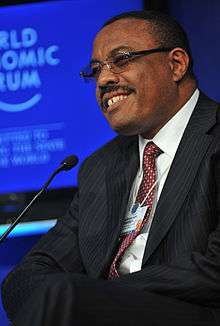 Hailemariam became the permanent Prime Minister on 21 September 2012. European Parliament President Martin Schulz, after meeting with Hailemariam, said that his desire "to strengthen democracy in the country, allowing for greater pluralism and a freer civil society, to uphold the freedoms enshrined in the Ethiopian constitution" was clear. In February 2014, Hailemariam Desalegn met in Addis Ababa with a visiting delegation from Somalia led by Somali Prime Minister Abdiweli Sheikh Ahmed to discuss strengthening bilateral relations between the two countries. Hailemariam Desalegn pledged his administration's continued support for the peace and stabilization efforts in Somalia, as well as its preparedness to assist in initiatives aiming to build up the Somali security forces through experience-sharing and training. He also suggested that Ethiopia and Somalia should increase bilateral trade and investment. Additionally, Hailemariam Desalegn described the growing ties between both nations as a break from the counter-productive policies of past administrations, marking instead the opening of a new chapter where mutual stability is beneficial. For his part, Ahmed commended Ethiopia's role in the ongoing peace and stabilization process in Somalia as well as its support against the Al-Shabaab militant group. He likewise welcomed the Ethiopian military's decision to join AMISOM. The meeting concluded with a tripartite Memorandum of Understanding agreeing to promote partnership and cooperation, including a cooperative agreement to develop the police force, a second cooperative agreement covering the information field, and a third cooperative agreement on the aviation sector. "If we remain committed to the ideals of justice, liberation and above all the sanctity of human dignity, we can ultimately prevail over evil, no matter how stacked the odds are against us." "What we are doing today is not so much mourning the passing of an icon...[but] as a celebration of humanity at its finest" —in his speech at Mandela's state funeral in South Africa. ↑ "Hailemariam Desalegn's Biography". Durame News Online. 22 August 2012. Retrieved 14 September 2012. ↑ Ethiopia: The Hailemariam Desalegn Factor. Retrieved 10 September 2012. ↑ Hailemariam/Roman Apostolic church of ethiopia; For detailed information see: "The New Prime Minister’s Faith: A Look at Oneness Pentecostalism in Ethiopia," in PentecoStudies 12/2 (2013): 188–204. ↑ Berhane, Daniel. "Ethiopia - Who's Who in the New Cabinet?". Daniel Berhane's Blog. Retrieved 20 June 2013. ↑ "Ethiopian Prime Minister Meles has died: state television". Reuters. Retrieved 21 August 2012. ↑ "Schulz on the meeting with Hailemariam Desalegn, Prime Minister of Ethiopia". European Parliament. 17 April 2013. ↑ "Ethiopia: The Prime Minister of Somalia On a Visit to Ethiopia". Government of Ethiopia. Retrieved 17 February 2014. Wikimedia Commons has media related to Hailemariam Desalegn.